On the back of a blog we wrote a few months ago about multi-room audio, we got the following question. Is there such a thing as multi-room video? You may scratch your head when you hear the term “Multi-room video” and think…what the heck is that? At Rapallo, we regularly receive inquiries from customers who would love to have the ability to share a few video sources such as their Sky box, Apple TV and Blu-ray player in different rooms. It’s a great way to save time and money. And you guessed it, depending on your situation there are a few solution to choose from. It can really be as sophisticated or as simple as you want it to be. Which brings us to the question: How do you go about creating a multi-room video system? You’re probably sick of us saying this, but we’ll do it anyway. As with many other things in life, there is no substitute or getting away from some decent planning. How Many Rooms (or displays) in the Multi-room video System? As a matter of fact, things are not that dissimilar to multiroom audio when it comes to considering how many rooms or displays to include in the whole home system. Or your solution could be a s simple as introducing an HDMI splitter. An HDMI splitter allows you to connect multiple HDMI displays (TVs, computer monitors or projectors) throughout the house to your video source (a Sky box, Apple TV, Blu-ray player). While this is simple enough, computers and laptops are also notoriously challenging when it comes to splitting it to multiple displays. This is due to the infamous “HDMI Handshake”. The HDMI handshake is a sort of “language” spoken between an HDMI source and an HDMI display. When the handshake is “established” the source sends a message to the displaying. It says :” I am a Blu-ray player and I want to send you 1080p content”. The display then either answers with “sure, no problem”. Or “no, don’t send me 1080p because I am a 720p display”. As soon as this short “chat” between the two devices has finished, you will see the content from the Blu-ray player in the correct resolution on the display. Until….the source or the display puts itself into sleep-mode, on stand-by or turns itself off. If one of the two devices is no longer connected to the source, and sometime later the connection is re-established, the handshake needs to be performed again. And that is where laptops and computers are not always playing (HDMI) ball….They seem to remember that they had the connection before and don’t bother doing the handshake again. And they are stubbern. The other problem we experience quite regularly with computer sources is that their HDMI output ports are not very powerful. And the HDMI signal does not go further than 5 meters over HDMI cables…. No need to explain further. Which is a good segway into the subject of HDMI cables in multi room video. HDMI or CAT for Multi-room video? Most people know CAT cable (or “Ethernet Category 6 /CAT6” cable but also called UTP or unshielded twisted pair cable) from computer connections. That is if you are not part of the ‘wireless crowd’. So what does CAT cable have to do with HDMI and multi-room video? Well, the transmission of digital video can be done in a few ways. The most well-known cable to transmit digital video is the good old HDMI cable. The HDMI cable has some advantages. Think about benefits such as the ability to transmit audio and video in high definition without compression and with a standard connector between sources and displays of different brands. HDMI connectors are quite fragile though and more annoyingly. They won’t go further than 25 meters and in 4k not more than 10 meters unless you buy uni-directional active HDMI cables. That is why some years ago, a different technology was developed to allow for audio and video to be transmitted over much longer distances than 25 meters. And so HDBaseT was born, a standard protocol to allow for HDMI, ethernet and USB signals to be transmitted over CAT cables of up to 100 meters. As long as you are happy with a certain level of compression, HDBaseT is an option in 4K content streaming over CAT cable. Obviously, HDMI cables are still unbeaten as they can transmit 4K without compression at 18 Gbps (gigabit per second), whereas HDBaseT has a maximum speed limit that is lower than 18 Gbps. But in life, sometimes compromises are called for. So …. while there may be some compression, the HDBaseT system can also transmit infrared commands over the same cable and it will go much further than the meagre 10 meters for 4K HDMI cables. And….the cost of 4K HDMI cables is quite a bit higher than the combination of a CAT cable with an HDBaseT transmitter and receiver. It will not come as a surprise that HDBaseT is very popular in multi-room video. In case you were having wireless ideas ….think again. Even though wireless HDMI exists, the cheaper versions are unreliable at best and the ones that work are only point to point between one source and one display. Nothing ‘multi’ about wireless HDMI. Installing a wireless HDMI matrix network of displays and sources is a type of technology that is not yet available. In other words, while wireless multi-room audio is becoming bigger by the day. No such thing on the charts yet for video. Bart has spun a yarn on this topic before: as far as he is concerned the AV industry is stuck in the stone ages as far as remote control is concerned. Either you use infrared (IR), or you use the antiquated RS-232 protocol (if available). The first one is cheap but requires line-of-sight between remote control and the device, and the second one is complex to program and more expensive. 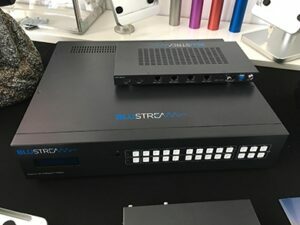 Control 4 and Crestron seem to be established brands of professional but quite expensive alternatives to RS-232. We believe that IR remote control can work well if you install it properly. IR remote control really only works with HDBaseT matrices (Yep, them again). Matrices based on HDMI cables won’t work very well and are not flexible at all. The beauty of HDBaseT matrix solutions is that the IR receiver at each display can receive IR commands for all sources. And these commands can be transmitted over the single CAT cable between the display and the matrix. This technology is tried and tested and reliable over distances up to 100 meters (which we are thinking is more than sufficient for the average New Zealand house). The number of video sources is also a key question to answer. Do you want to watch to the same source in all rooms? Or would you prefer the option to simultaneously stream different sources to separate displays? The answer to those questions will determine if you can get away with a simple HDMI splitter or if you have to go for a matrix switch. The more sources you involve in your set-up, the more complicated (and costly) your solution will be. 4 sources are common. If you go over that, unfortunately, the matrices available are only 8 input devices, with a much higher price. You can connect up to 4 sources (or inputs) like a Blu-ray player, Xbox, Skybox, etc… via HDMI. Typically, the sources are physically in the same cupboard or “rack” as the matrix. Then you connect up to 4 CAT cables to the 4 outputs on the matrix, and the matrix acts as an HDBaseT “transmitter”. At the other end of the CAT cable a “receiver” box will translate the digital video and audio from the CAT cable to an HDMI cable. That short HDMI cable and the receiver box are typically hidden behind the TV, in the gap between the TV and the wall. The receiver box also allows for an IR receiver “eye” to be connected to it. The IR “eye” is usually taped to the side of the TV, so you can point your remote control at the “eye” and then you can control any of the 4 sources that are connected to the inputs of the matrix. Pretty clever! Just bear in mind that if you want to watch a movie on the Blu-ray player, anyone else will have to watch the same movie. Or they would have to change to another source. Basically, anyone sharing a source will have to watch the same program of that source. Ready for DIY or Do You Need a Contractor? Some tasks, such as a matrix set-up, IR programming and even running AV wires (not electrical) between separate rooms, can be done by homeowners, as we explained in our pre-wiring blog. It very much depends on your own capability to handle these things. If you’re not sure, we say leave the pulling wires to a professional. Other more complicated installations, such as customized video over IP installation, integration and programming into home automation systems are probably best left to a certified installer like Rapallo. So talk to us about your ideas on multi room video setup. We’ll happily provide you with some professional advice and a budgetary estimation and put you on your way .